Are you a people person? 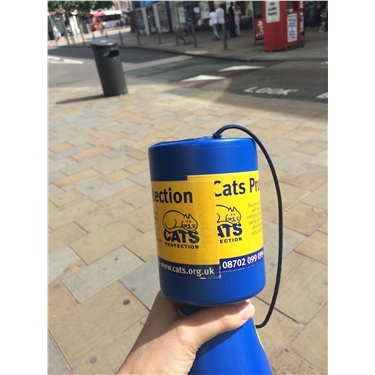 Want to help our cats? Can you spare just ONE hour a month? We are in need of new volunteers to help out our Street Collection team, collecting once a month in Wolverhampton City Centre. Collections usually take place in Victoria Street or Dudley Street - and at the moment we're struggling to get enough people to collect for a full day. All you need to do is be friendly, smiley and love talking to people - be confident talking to the public and able to hold a collection tin for an hour. Each volunteer does a one-hour shift between 10am-4pm. We collect in all weathers from March to December so if you attend every collection it's merely ten hours a year of your time. Of course, if you've got other commitments there's no obligation to attend every collection - just let us know in advance that you can't make it. To view a list of the dates for 2017 please click here. We'll make sure that during your first few shifts you'll buddy up with an existing Street Collector for help, advice and support, and you'll need to be over 18 to collect for us. You'll be given an ID badge and will wear a high-vis vest (supplied) so that you can easily be recognise by the public. If you're interested in helping out, please download our volunteer application form, fill it out and drop it into our shop at 7 Warstones Drive, Penn WV4 4PP. Alternatively you can email it back to us at cpwolverhampton@virginmedia.com - you can also use this address to send any questions you may have if you'd like to know more.